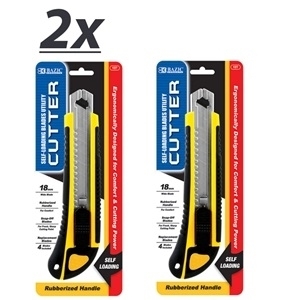 Package Includes: 2x - BAZIC Heavy Duty Self Loading Cutter W/ Grip + 2 Replacement Blades. Rubberized grip for handling comfort. Steel top for safety guide. Steel track for strength and durability. Furnished with two 18mm seven snap-off points each, loaded into the self-load handle. Slider mechanism has audible “click-stop” for greater blade security. 17 -position slide exposes variable blade length. Compatible with 18mm Snap-Off Replacement blade.